Blogs are over, right? They are only for moms or wacky conspiracy theorists. Welcome to 2017, where every business website – including yours – needs a blog. The blogs of yesteryear are gone, and today’s blogs are actually more like articles – so it’s time to change your thinking about them. How often do you check Facebook on your phone? How often do you click on articles your friends have shared? How often do you share those articles? Word spreads like wildfire on social media – and you need to be taking advantage of that! Having a well-written blog post on your website allows you the opportunity to post that on your business’ social media sites for everyone to read…and share! That increases user interaction, which increases the number of times your Facebook or other social media platform is being exposed to your followers and potential new followers. Oh, and did we mention that clicks to your blog post brings people to your website? And once they’re on your website, it’s much easier to get people to browse it and see if what you’re offering – product or service – is something they could potentially use. We are well beyond the information age. Everyone can Google or simply ask Siri for the answers to their questions…but the question you need to answer is, will YOUR business show up on those search results? Perhaps, if someone Googles your business specifically. But don’t you want your business to show up in online search results when people don’t even know they’re looking for you? Your business website needs a blog because it increases the chances of random people finding you. Let’s say you’re a credit union. Imagine someone Googles, “Should I use a bank or a credit union?” and the first item that comes up is an article from a bank – because that particular bank had a blog about “5 Reasons a Bank is Better Than a Credit Union.” Bummer. Now imagine that you, as a credit union, have a blog on your website titled, “6 Reasons Why You Should Use a Credit Union Instead of a Bank.” Now you have the opportunity for that to show up on a Google search, and for new customers to head your way instead of the neighboring bank. Score! 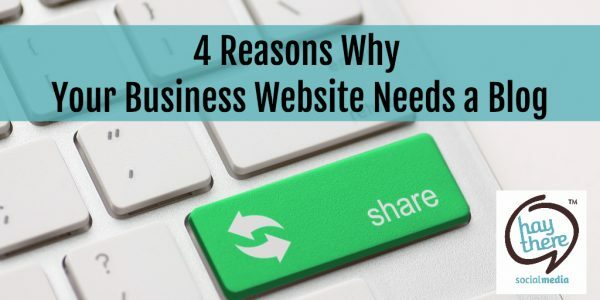 If your website has just the basics, you may be losing out on opportunities. Let’s say you have an About Us page, a list of the products or services you provide, your locations and contact information – and that’s it. Sure, that may be all someone needs to know when they’re looking at your website. Maybe they just Googled you specifically to find your phone number or location. But what if they’re searching for the best business, product or service to fit their needs? If someone lands on your website and finds a bunch of blogs answering common questions or providing helpful information, that helps establish your credibility and makes you appear to be more of an expert on the product or service you provide. You’re good at what you do at your business – but does that include writing? At Hay There Social Media, our team has previous experience in newspaper reporting, journalism, editing and public relations. That means we’ve been professionally trained to write. And, as such, we have the uncanny ability to research and write on any topic. We know how to research topics related to your business – and we know which reputable sites we can learn from. But we also learn from talking to you, and from interviewing other sources when needed (because we’ve had plenty of experience interviewing professionals in varying public and private sectors). And we know why your business website needs a blog. Let Hay There Social Media write your business website blogs. At Hay There Social Media, we know what works in the social media world. We know what your clients want to read about, we know how to come up with topic ideas, and we know how to write professional blogs for your business. Contact us today to set up a meeting to find out how we can help your business website with a blog.